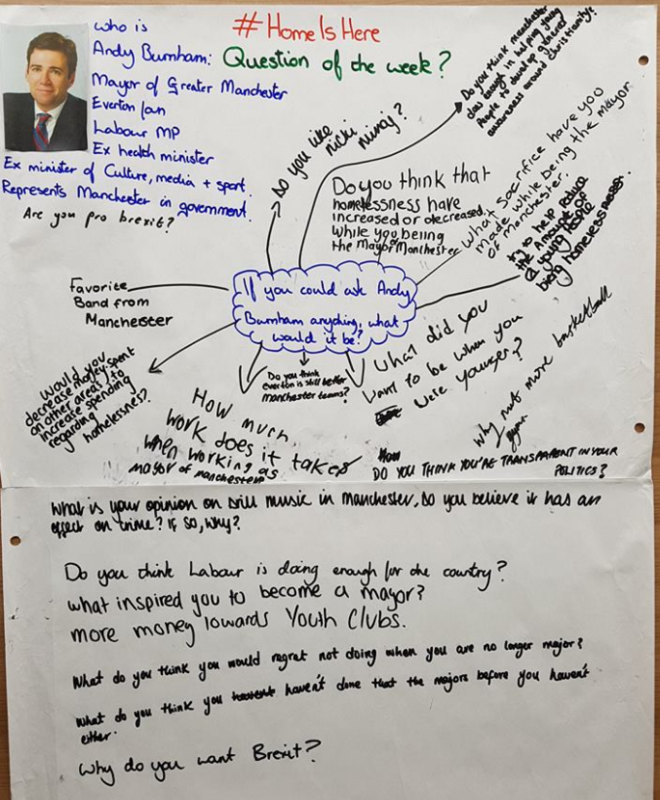 As part of our #HomeIsHere project, our young people came up with questions for Andy Burnham, the Mayor of Greater Manchester. #HomeIsHere aims to develop young people to make the most of their voice and to tackle extremism by encouraging issue-based debate. 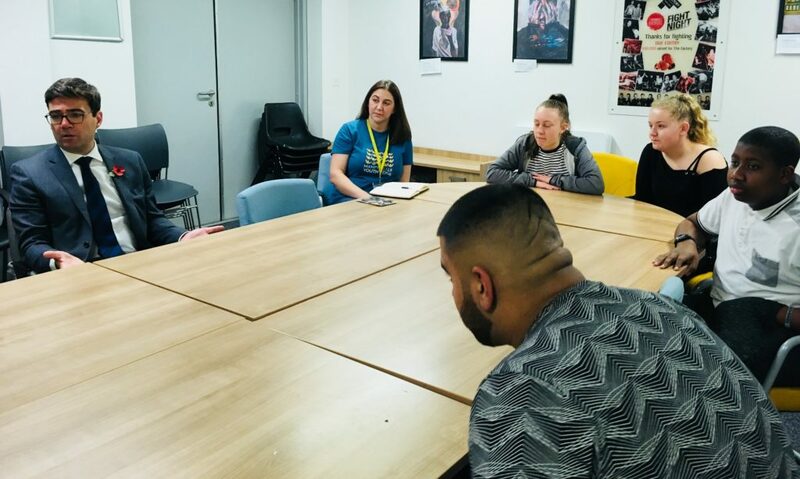 Our young people came up with plenty of thought-provoking questions about modern-day issues they feel passionate about (ranging from the rise of homelessness, to transparent politics, to his favourite Mancunian band!) which were posed to Andy Burnham on social media. 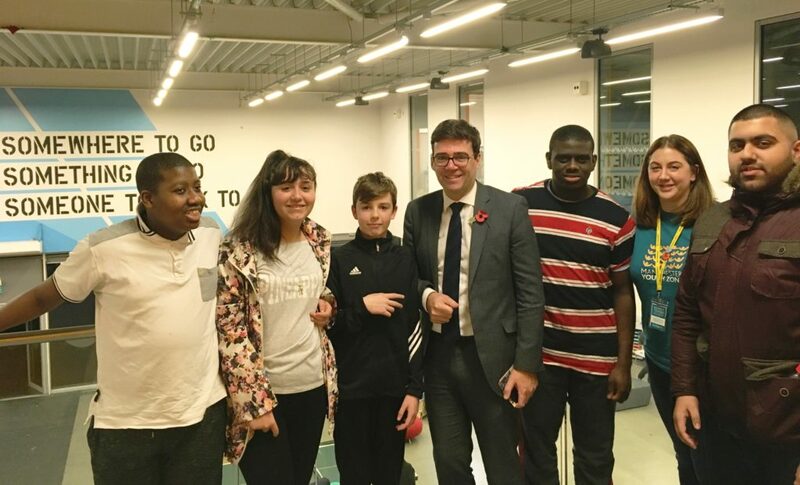 In response, Andy Burnham came to Manchester Youth Zone to host a Q&A session with some of the young people taking part on #HomeIsHere. One of the first topics of discussion was about the Manchester Arena attack in 2017. Andy told us how hard it was for everybody and that the city had not yet fully recovered from the tragedy. However, he was proud with how Greater Manchester came together to reject what the terrorists wanted, which was to divide us. Andy Burnham has been very public with his priority of reducing the effects of homelessness – as can be seen in a new scheme to provide A Bed Every Night for every rough sleeper this winter and setting up Tackle4MCR with Manchester City captain, Vincent Kompany – but another priority is providing young people with better opportunities with education, work experience and work shadowing, which includes plans to provide young people with free bus passes so there are less barriers in the way of getting to work or school. Andy Burnham closed the Q&A by asking the young people a question of his own: what was their top priority that they felt needed addressing? There were a variety of answers, including school funding and the effect of plastic on the environment, but the main issue that was discussed was knife crime. Over the last 2 years, knife crimes in Manchester City Centre has risen dramatically and this has impacted Harpurhey and the surrounding North Manchester area. Points discussed were the reasons why young people may carry knives, whether they’re out with the intention of using weapons, to make themselves “look hard” or for self-defense. We also discussed the length of sentence criminals receive and whether police should be allowed to stop and search more people, and the risks of agitating groups further. We’d like to thank Andy Burnham for taking the time to speak with our young people in a very productive Q&A session. We discussed some very pertinent issues concerning Manchester today and provoked polite and measured debate – it isn’t often you see that nowadays! For more news from Manchester Youth Zone, please follow us on Facebook, Twitter, LinkedIn and Instagram!